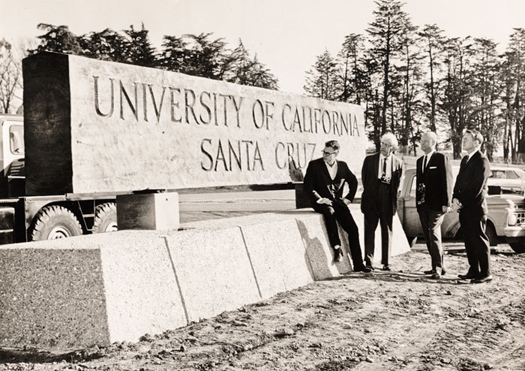 UC Santa Cruz’s founding chancellor, Dean McHenry, second from right, at the installation in 1966 of the original carved solid redwood sign that has defined the main campus entrance. Fifty years later, the bold new model of higher education that emerged from the fledgling campus has helped change the world’s understanding of countless ideas and issues: from astrophysics to organic farming, from ocean health to human rights, from artistic and literary expression to genomics and cancer research. As UC Santa Cruz continues to forge ahead in 2015, the campus will mark its 50th anniversary with a variety of events throughout the year, including exhibits of iconic art and photographs, special activities during the annual Alumni Weekend in April, and a series of events in the fall that will celebrate the campus's roots, demonstrate its growth, and showcase its future. When UC Santa Cruz opened in 1965, it was one of three new University of California campuses that would dramatically expand the opportunities available to California students and researchers. These universities were the answer to California’s post-war baby boom. While the San Diego and Irvine campuses followed a more traditional model, UC Santa Cruz established itself from the beginning as a center of doing things in new and different ways. Modeled on Oxford University in England, UC Santa Cruz was designed as a cluster of decentralized small colleges, where students could have daily contact with their professors, while still being part of a large research university. Over the past 50 years, UC Santa Cruz has grown from just 652 students in the first class to more than 17,000 students today. Much has changed, both on campus and in the world at large, but the bold spirit of inquiry and experimentation that characterized UC Santa Cruz from the start continues to foster transformative student experiences and groundbreaking research. 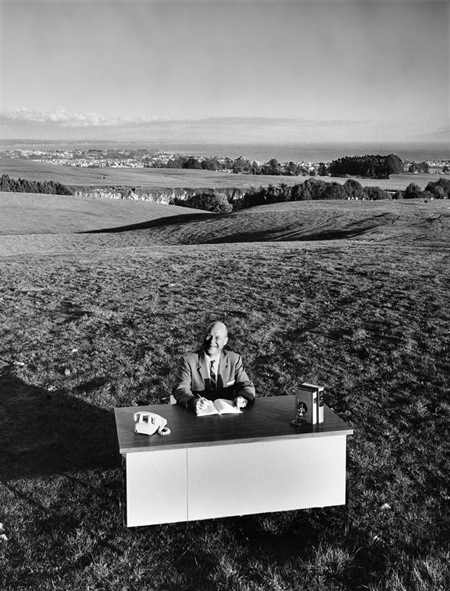 For more information about the 50th anniversary—including an interactive timeline of the campus history and achievements, and high-resolution early photos from Special Collections at the UC Santa Cruz McHenry Library—go to 50years.ucsc.edu.